Click for Harmony: Horse Hero and Inspiration! I feel I'm really making huge progress at the moment! With my Straightness Training subscription coming to an end and keen to explore other avenues of inspiration and expertise I took out a subscription to Horse Hero and I'm SO glad I did, I'm learning so much from the videos on there and I've only just begun working through the ones of most interest to me. Next on my watch list are a series of lessons on horse and rider posture by Peggy Cummings but here are some of my discoveries so far. Turn or change the rein by tightening your outside buttock and thinking of "putting your inside bottom onto the horse's outside bottom"
Press your heels outwards if you're using your legs too much (I've found this very useful in canter where I have trouble stopping myself nagging them, to keep them in canter). To canter simply think of putting your inside seatbone forward and down - nothing more than that. Absorb the movement in canter by thinking of pulling your stomach up into your chest, while always keeping your inside hip forward and down. To stabilize your seat generally think of pushing your lower abdomen into your hands. Then I found Karen Rolfe's video on a different approach to riding lateral work and I now use it as a warm up all of the time. 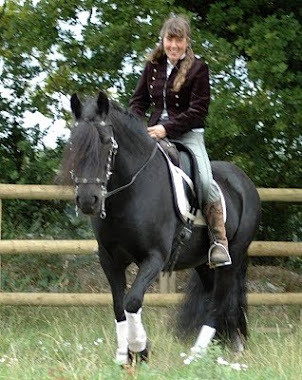 She was riding a beautiful young Friesian which focussed my attention straight away. I do love baroque horses, especially black ones! She said on the video that both riders and horses get tense and anxious about lateral work and so it's very useful to start by taking power out of the movements, so both can relax and get used to the feel of being in the right position before adding power back in. She begins by walking around the arena and using the corners or circles to set up the lateral movement, then halting and rewarding the horse once it's in correct position. She stands for a while in that position, so they get used to how it feels, then walks on again and sets up the next movement. She then does the same in trot. Once the horse is really confident at organising his body into the right positions for the movements she gradually asks him to continue in the movement for a stride or two before halting and gradually fades out the halt when the horse is really comfortable and relaxed with the whole process. To me this seemed such an obvious, simple and sensible way of beginning ridden lateral work that I can't now believe it never occurred to me before! I can't begin to tell you just how much difference this has made to Bella, Grace and I! 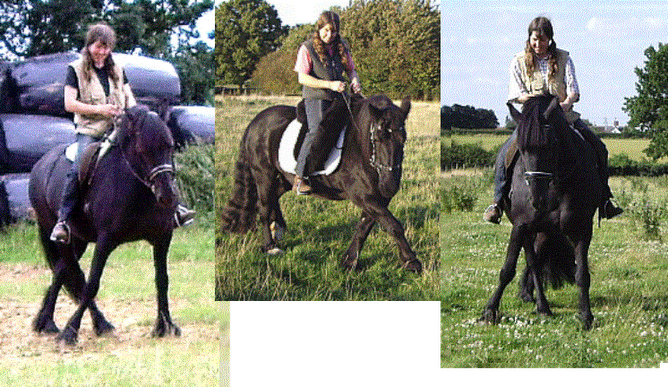 I'm totally at home with working them in all the lateral movements in hand but not nearly so practised in the saddle. Grace has always tended to want to rush when you ask her for anything so this approach is brilliant for her and is making her much softer, lighter, better balanced and more relaxed. Bella only gets tense in as much as she gets a little 'fiddly' with her bit sometimes in lateral work which negatively affects her balance a little. Using this new strategy she is now staying relaxed in her jaw. I've also adapted the technique a bit and after halting in, say, travers, I ask for a bit more lateral flexion before I click her as she's not the most naturally bendy of horses. I was a little bit worried about losing 'forward' doing this with Bella so I quickly progressed to doing just a little of this in walk, then in trot, and then continuing in the movements for a few paces in walk and in trot, so I'm clicking and reinforcing her in movement as well as in halt. I've now realised that it was silly of me to worry. Bella understands me, and understands chains of behaviour and lateral work so well that there was never any danger of her getting confused about what she is supposed to be doing. I thought Bella was lovely to ride before but using this technique has turned her into a complete joy! She is so chilled out, focused and relaxed, with even more power to her trot. It's definitely helping us in working towards passage. Yesterday I rode her in a very strong wind in our tree and bush lined, spooky outdoor school. She was rampantly in season (so much so that she didn't really want to leave the yard as there was a new gelding in there and she was much more interested in flirting with him than going anywhere with me!) 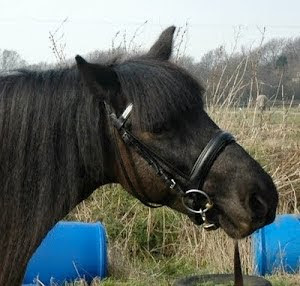 but she never spooked or lost her concentration once and gave me her best effort 100% of the time. She really is the pony of a lifetime and we are going to make the very most of this summer!